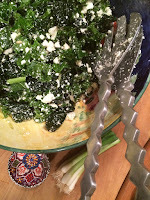 I like to think of ricotta salata as an Italian feta, and whether you’re serving ham or lamb on Easter Sunday this refreshing kale salad will be great with either. And it couldn’t be simpler, in a mason jar combine two minced scallions, a quarter teaspoon of kosher salt, and four parts extra virgin olive oil to one part fresh lemon juice then shake vigorously to emulsify. Crumble the ricotta salata into a large bowl of chopped kale then toss with enough dressing to coat well.